IDX Stories Do you know a Tech Savvy Elder? Do you know a Tech Savvy Elder? 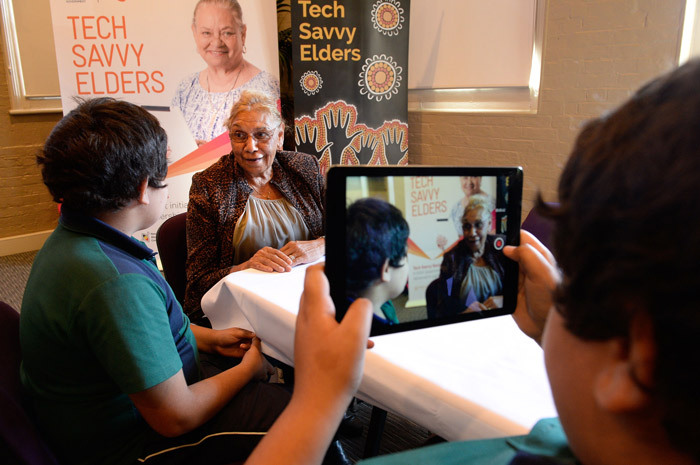 Last year Gamilaroi Elder Aunty Beryl took part in Telstra’s Tech Savvy Elders program – where school students teach Indigenous Elders about technology. “Education takes you where you want to be,” Aunty Beryl tells the students. She moved to Sydney at 16 to become a teacher, and then took her education back to her community – she never forgot where she was from, she says. Her hope is that young people will carry on the traditions of her culture. Do you know a Tech Savvy Elder? There’s still time to nominate someone for Australia’s first IDX Awards Digital Elder of the Year. The 2017 Digital Elder of the Year Award recognises an Elder who has demonstrated excellence in the digital landscape. We invite you to nominate a Tech Savvy Elder in your community. ​Nominate yourself, or someone you know for a chance to win a share of $100,000 worth of prizes and grants. To make a nomination click here https://idxawards.org.au/nominate/. Nominations close this Saturday 29th April 2017. The winners will be announced at a gala event in Sydney on Friday 29th September 2017. The National IDX Awards seek to recognise and reward Aboriginal and Torres Strait Islander people demonstrating Indigenous digital excellence and promote and support new opportunities and ventures. Spread the word and help us showcase Indigenous Digital Excellence in remote, rural and urban communities. Share the link to nominate https://idxawards.org.au/nominate/ across Facebook, Instagram and Twitter using #IndigenousDX or #IDXAwards. Alternatively, please share this email via your networks and encourage individuals and organisations to nominate for the 2017 National IDX Awards. Thank you for helping us showcase Indigenous Digital Excellence. If you have any questions please contact us here.